ps I've just fitted the Zunsport grills to mine, although a different version than you would have used, there was a point I thought they just would not fit but they did. The final result is a very very snug OEM fit I think for your model the ones you have fitted look better with the light replacements though. Thanks a lot Jonttt, white with black is the only way to fly! Chuffed everyone has given the thumbs up on the DRLs/Grills. Fitting the Zunsport was ballache, not impossible, but nothing like how easy these went in. Liking the grills, good find and good job. Car is looking nice. Cheers, Nigel. That's a full house then.... seems I made the right choice. I wonder how that chap that bought the Zunsport from me is getting on with them. Thanks Lee, I am dead chuffed with them. I do not miss the Zunsport grills and crusty old fog lights in the slightest. Thanks, Chief, the car is a dream come true. Every drive an adventure, always look back as I walk away. And it has been pretty d*mn practical, two boots and a parcel shelf has meant I have not once been in need of more storage. And now I have my other P&J safely stowed on the roof, the car has been no less practical than my R32. What with more decent weather and having had the car a fair old while now, have been exploring the limits of grip a bit more, all I can say is "Wow", the speeds this thing corners at compared to my R32. Also had a lot of love from 'random badgers' out in the wild, usually at Petrol stations in fairness. Met a nice chap at Tesco petrol station over the weekend in Eastbourne, he was in a mint 996 C4S that he had bought from RSJ. We had a proper old chin wag about both cars. Love this car! Had the car over 6 months now, still love it as much as the day I got it. Just had it MOT'd and the aftermarket HIDs and the DRLs wired up as sides got through the MOT no problem. Did have the three bolts on the driver's side mani/exhaust gasket fail. A very common problem according to our in-house expert. Got both sides replaced at Barr-Tech in Cambridge, nice chaps and did me for the minimum amount possible by all accounts. 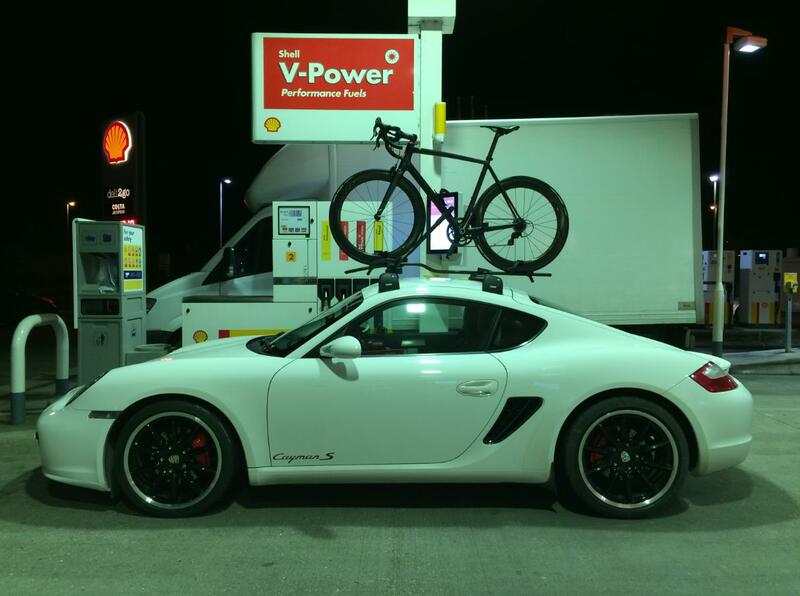 Got the car booked in for a 60k major + brake fluid at Precision Porsche near Brighton this month. Whacking in Millers (as did the previous owner) and getting the gearbox oil swapped out. Bought new centre caps on Ebay, at 20 squid worth taking a punt I thought. Then do the brakes come the spring. 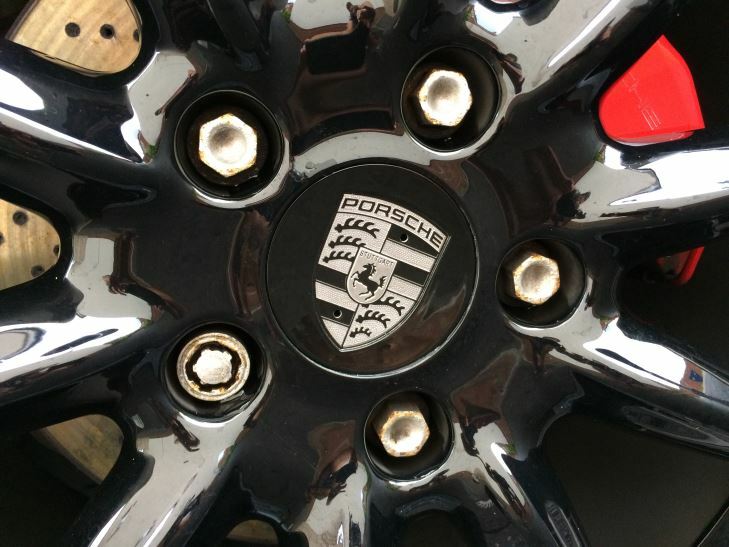 Few updates, bought some new wheel caps from Ebay, from the link I posted above. Happy with the products I must say! So now my car has had all the consumable done and the weak spots too. Poly belt, Millers, Plugs, Coil Packs, brake fluid and gearbox oil. Previous owner did the rads/cons not long ago, as well as the window regs and membranes. The LED Spars and associated grills are doing a superb job, the ducts were as clean as a whistle when Iain and I inspected them during the service. 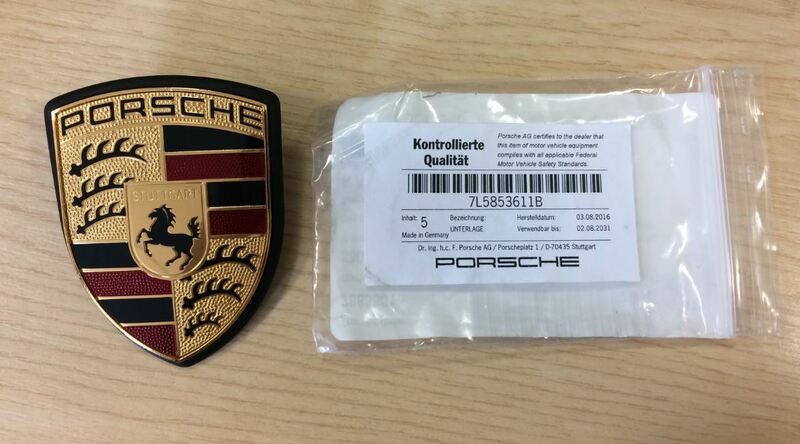 Have today ordered a new front badge from Porscheshop, says its OEM so worth a punt at 60 squid. 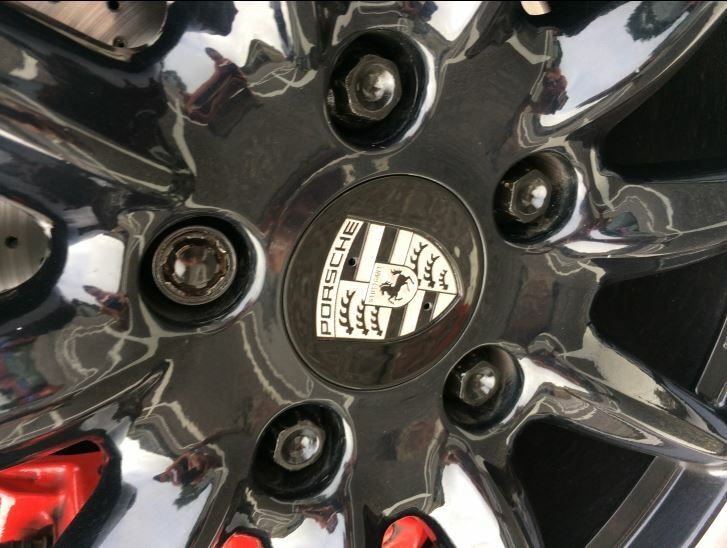 Iain at Precision even refinished the wheel bolts to match the wheels and painted the carrier is it?! 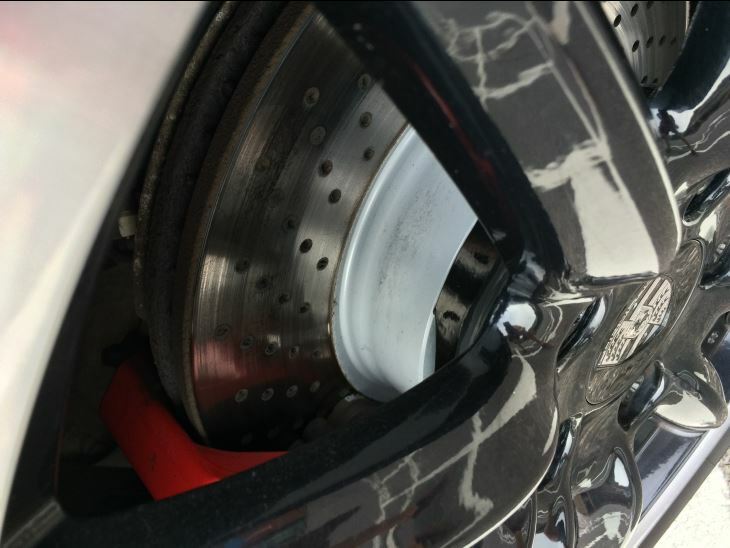 Thats part of the disc and is refered to as the Disc Hub , the colour is the same as when it was new although you could paint it black to match the wheels if you wanted to . Cheers Demort, the carrier is part of the brake assembly then yes? At least it is on the R32 IIRC. New badge arrived next day delivery. All legit in terms of packaging and part numbers. 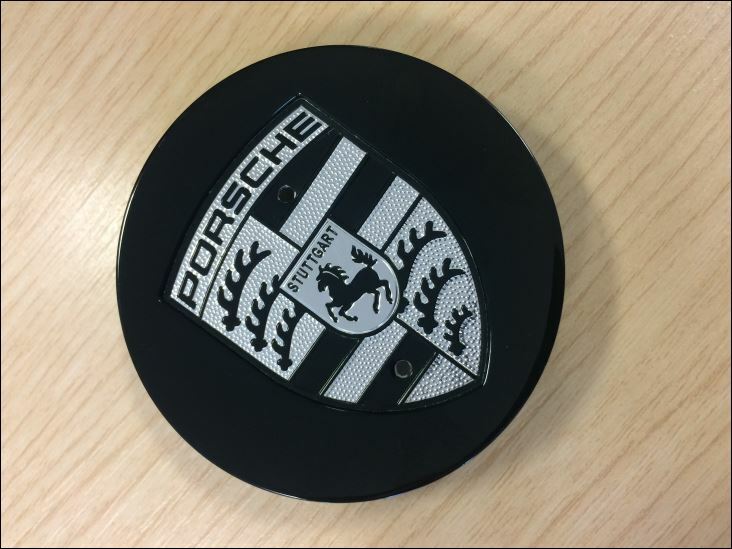 Great price from PorscheShop. No thread on the pins however? Wonder how the bolts attach to it? Cheers, Chief. Must admit I was perplexed by the lack of thread. Youtube vids make it look like an ultra quick job. Car is looking good, going to give her the full 12-14 hour detail in the coming weeks. Will be interesting to see the results on white! p.s. How's the Amber Alert? The nuts cut their own threads on the badge pins . Put your hand on the badge then with a 10mm socket on an extension push up on the nuts and turn . New nuts are the norm but you can reuse the old ones .. they should have a rubber seal on the nut . You Only nip them up .